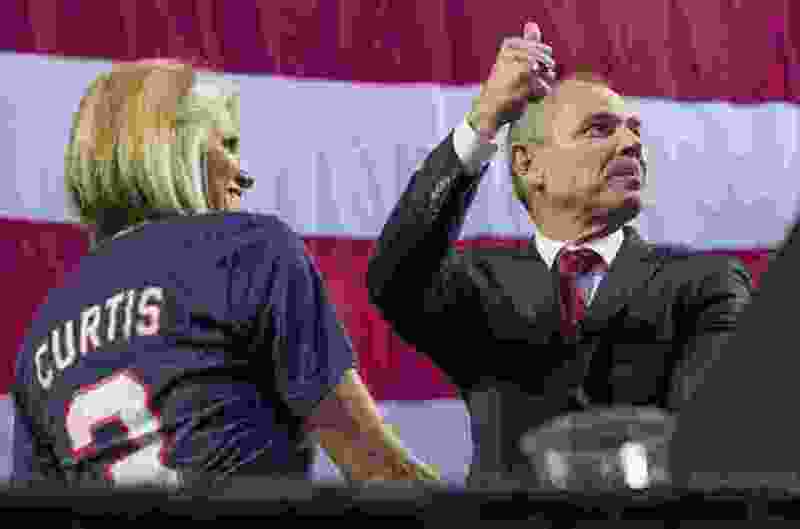 (Leah Hogsten | The Salt Lake Tribune) Incumbent John Curtis, of Utah's 3rd Congressional District, joined by his wife Sue, gives a thumbs up to his supporters at the Utah Republican Nominating Convention Saturday, April 21, 2018. Curtis and candidate Chris Herrod will face off in the primary. Chris Herrod worked this campaign to convince voters in Utah’s 3rd Congressional District that he’s their guy in the Republican primary race. Incumbent U.S. Rep. John Curtis is “not conservative,” he said after a debate last month. Curtis has the support of 57 percent of registered Republican voters just days before Utah’s primary election, compared to 21 percent support for Herrod, the poll shows. “We would expect that Curtis would be polling better among moderates because Herrod has specifically designed his appeal around reaching out to the most conservative, more extreme wing of the party,” said Adam Brown, an assistant political science professor at Brigham Young University. “The fact that even that appeal ... even those that are most conservative are going for Curtis, suggests that even saying things that appeal to the most conservative voters won’t overcome an eight-year track record as mayor of a major city,” Brown said. Curtis was a popular Provo mayor until he stepped down last year after winning a special congressional election. The poll, conducted by the Hinckley Institute at the University of Utah from June 11-18, surveyed 183 registered Republicans in the 3rd District and has a margin of error of plus or minus 7.2 percentage points. This year’s race might seem familiar to voters in the district that straddles the line of Salt Lake and Utah counties. Last year they chose between Curtis, Herrod and Republican Tanner Ainge to replace former Rep. Jason Chaffetz, who left mid-term for a job at Fox News. Curtis won that three-way race, and he later soundly defeated Democrat Kathie Allen. The poll shows the district’s voters approve of the Curtis’ work since they elected him, with 57 percent strongly or somewhat approving his performance. Eighteen percent disapproved, and 25 percent were unsure. Republican Party delegates – who are typically more conservative than the general electorate – favored Curtis over Herrod at this year’s nominating convention. But they declined to give Curtis a big enough win to allow him to skate straight to the general election and bypass a primary, setting up the race with Herrod. The Tribune’s poll follows others that also showed Curtis with a commanding lead, and it was definitive enough for Herrod to acknowledge that he faces slim odds come Tuesday. “We knew that it was an uphill battle from the beginning to take on someone who has the incumbent status and the ability to raise money,” he said. Curtis has far outraised Herrod during the election cycle. He has also been willing to critique President Donald Trump, whom the survey shows also is viewed very favorably in the district. Some 69 percent of the 255 voters surveyed in the 3rd District had a very or somewhat favorable view of Trump’s performance. Curtis was critical of Trump’s talk of stiff tariffs against some of the country’s closest trading partners, supported the special investigation into Russia’s attempts to meddle in the 2016 and its contacts with Trump’s campaign, and on immigration. Herrod has backed Trump all the way. “It is somewhat surprising in the poll that President Trump is doing so well and yet we are not,” Herrod said. The poll results didn’t surprise the Curtis camp.